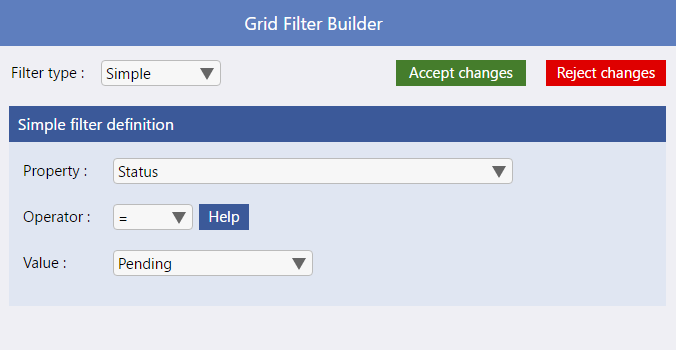 The build button on the Initial Filter Criteria takes you to the grid filter builder. Here you can define either simple or compound (multi part) grid filters. Simple Filters allow you to select a property, from the list of available properties in the entity property list and a value (either freeformat text e.g. "Pending" or from the drop down list of system values i.e. true, false, blank, empty). You can then use the filter operator to define if the property is to be equal to, less than, greater than, etc the value. Full details of the available operators may be found below. 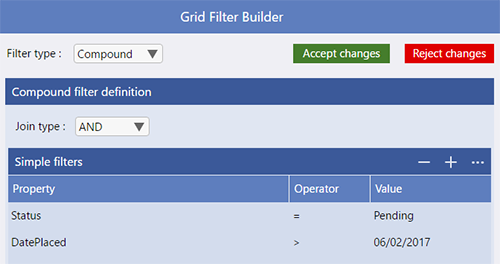 Compound Filters allow you to create a multi part filter criteria by joining together multiple simple filters. These filters will be joined either as "AND" or "OR". "AND" means that all simple filter tests must return true for the filter to allow the data item to be included and "OR" means that only one of the simple filters must return true for the filter to allow the data item to be included. You should create each simple filter, within the grid, as above by selecting a property, from the list of available properties in the entity property list and a value (either freeformat text e.g. "Pending" or from the drop down list of system values i.e. true, false, blank, empty). You can then use the filter operator to define if the property is to be equal to, less than, greater than, etc the value. Full details of the available operators may be found below. The + and - functions, in the header, allow you to add or remove simple filters and the ellipsys menu allows you to nudge simple filters up or down the list. "$index" For example, an initial filter setting of: $index < 5 will result in only the first 5 items in the root datasource being contained within the refined datasource (index values are zero-based). The =, >, >=, < and <= operators are supported for the $index property.